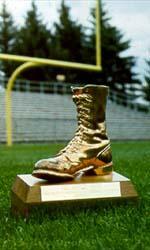 The Bronze Boot this year, with a fine blow-out! But someone had to win and yay, it's us! If it is Brigham Young or CSU. I wish I would have at least made the effort to go to a sports bar and watch this weekend!!! What? You didn't? You shame me, Krissy.